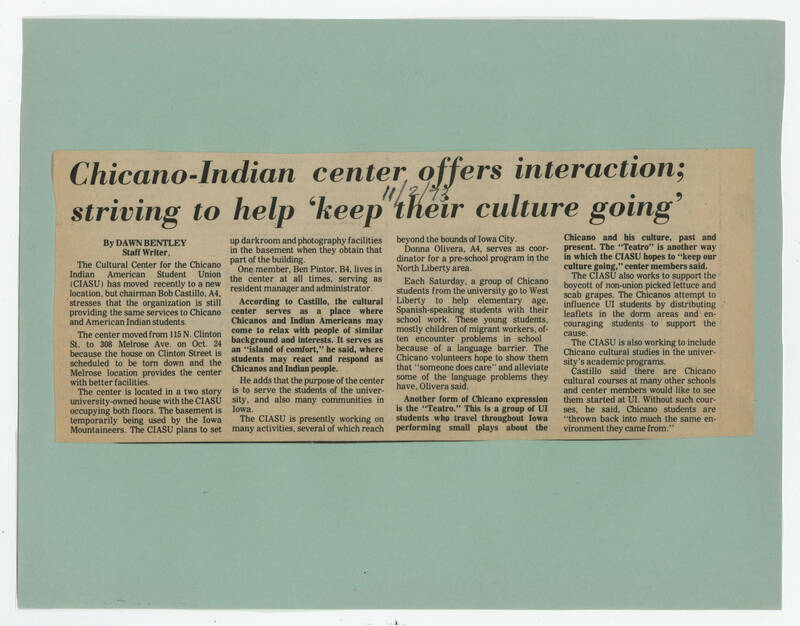 [[Header]]Chicano-Indian center offers interaction; striving to help 'keep their culture going'[[end header]] [[Handwriting]] 11/2/73 [[bold]] By DAWN BENTLEY Staff Writer[[end bold]] [[Article text]] The Cultural Center for the Chicano Indian American Student Union (CIASU) has moved recently to a new location, but chairman Bob Castillo, A4, stresses that the organization is still providing the same services to Chicano and American Indian Students. The center moved from 115 N. Clinton St. to 308 Melrose Ave. on Oct. 24 because the house on Clinton Street is scheduled to be torn down and the Melrose location provides the center with better facilities. The center is located on a two story university-owned house with the CIASU occupying both floors. The basement is temporarily being used by the Iowa Mountaineers. The CIASU plans to set up darkroom and photography facilities in the basement when they obtain that part of the building. One member, Ben Pintor, B4, lives in the center at all times, serving as resident manager and administrator. [[bold]]According to Castillo, the cultural center serves as a place where Chicanos and Indian Americans may come to relax with people of similar background and interests. It serves as an "island of comfort," he said, where students may react and respond as Chicanos and Indian people. [[end bold]] He adds that the purpose of the center is to serve the students of the university, and also many communities in Iowa. The CIASU is presently working on many activities, several of which reach beyond the bounds of Iowa City. Donna Olivera, A4, serves as coordinator for a pre-school program in the North Liberty area. Each Saturday, a group of Chicano students from the university go to West Liberty to help elementary age Spanish-speaking students with their school work. These young students, mostly children of migrant workers, often encounter problems in school because of a language barrier. The Chicano volunteers hope to show them that "someone does care" and alleviate some of the language problems they have, Olivera said. [[bold]]Another form of Chicano expression is the "Teatro." This is a group of UI students who travel throughout Iowa performing small plays about the Chicano and his culture, past and present. The "Teatro" is another way in which the CIASU hopes to "keep our culture going," center members said. [[end bold]] The CIASU also works to support the boycott of non-union picked lettuce and scab grapes. The Chicanos attempt to influence UI students by distributing leaflets in the dorm areas and encouraging students to support the cause. The CIASU is also working to include Chicano cultural studies in the University's academic programs. Castillo said there are Chicano cultural courses at many other schools and center members would like to see them started at UI. Without such courses, he said, Chicano students are "thrown back into much the same environment they came from."